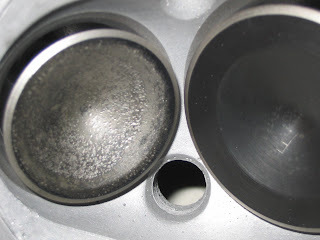 This is something you need to be aware of if you are building a hi performance engine. A person might think that the best way to select a cam is to look at your cylinder head airflow and pick a cam that has about the same lift as the point where the head's flow peaks. Yeah, you might think! Or inversely a person might have a cam lift in mind and pick a set of heads with the most flow at that lift. And the more lift the better, right? Yeah, you might think that too! In reality it is a little more complicated than that. In fact it is a lot more complicated than that, but I don't plan to address all of the complications in this post. Just one; Integrated Flow Area. This is sometimes called "area under the curve" and is a result of plotting cam lift in crankshaft degrees and adding the cylinder head flow for those lifts. This allows you to compare total effective airflow for two different heads with one cam (or two different cams with one head). This takes into account the cam duration and head flow at all lifts rather than just peak lift. It can be quite an eye opener! It allows you to see why a head with a great high lift flow may not perform as well as a head with less high lift flow, but better low/ mid lifts. This came to the forefront this week when Jason from Kokesh Motorcycle brought down the heads from a dragbike he purchased last fall. They happened to be the same S&S castings as I had ported for another local racer a couple years back. They also had the same valve sizes. Interestingly they were stamped with the I.D. numbers of one of the legends of Harley drag race porting. Now, before I go any farther, here is a disclaimer: I have no way of knowing what changes have been made to these heads since they left the aforementioned legendary porter. Any shortcomings I mention hereafter may have nothing to do with the original porting job! The first thing I noticed was that the valves had been "backcut" on the combustion chamber side to increase the valve to valve clearance. Upon further inspection it became clear that this was done in part to the use of 1.7: 1 ratio rocker arms. 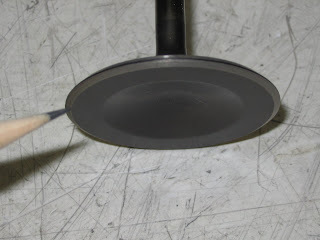 (stock is 1.625:1) This increased the TDC lifts of the valves, and indeed without the extra machining the valves would have hit each other during overlap. Trouble is, that extra cut invariably hurts the airflow. Comparing the flow figures for these heads with that of the heads I had previously ported, I found that they were from 13 to 21 cfm in the .500" to .650" lift range. The exhaust was even worse, being down 20 to 25 cfm from .200" lift and up. Much as I would like to chalk this up to my work being better, obviously a big part of the difference is due to the backcut on the valve. However, by comparing the integrated flow area on my Port Flow Analyzer software (the flowbench program I use), I was able to determine that Jason' bike would have better overall airflow just by going back to a stock rocker arm ratio and leaving the chamber sides of the valves uncut! Of course that is not what we are going to do. That would be too easy. And besides, we are talking drag racing heads here. You always want to make more power if at all possible. I have some valves on order which have slightly different profiles, and hope to gain some flow not only through the valves, but also with more porting work. How does this apply to your engine? Well, if your heads are already ported or you already have the cam you are going to run, then perhaps not a lot. But if you are in the process of designing/building your engine then it is something to keep in mind. When you are choosing your cam and valve size, there very well may be times when a larger valve with a milder cam may be a good option. Recently this was on my mind due to a conversation I had concerning an early drag bike. I was told that this particular Knuckle used a 2 1/4" intake valve with the old Lightening cam. This got me to wondering. With a wilder cam, there likely would not be enough room (valve to valve) for that big an intake valve. (the largest I ran in my own drag bike was a 2.100") Would the better flow from the 2.250" valve make up for the milder cam? Of course this is not the whole story in selecting a cam and valve sizes, but it sure is something to consider.